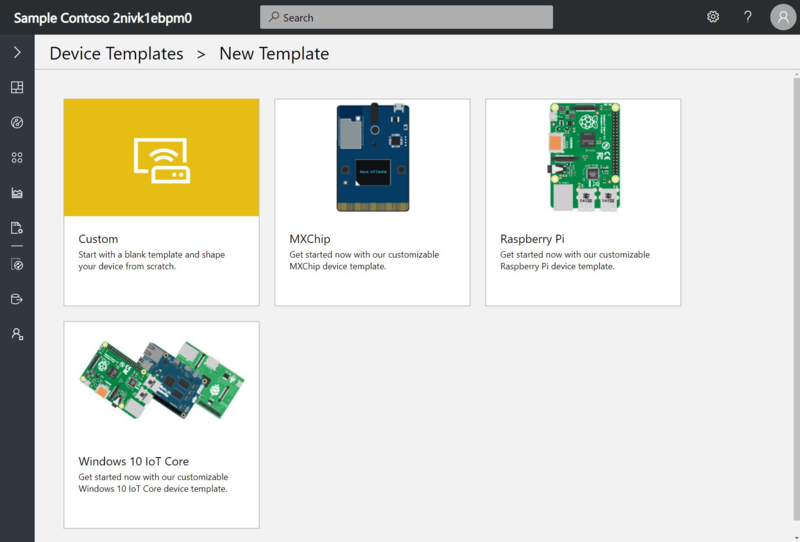 A device template is a blueprint that defines the characteristics and behaviors of a type of device that connects to an Azure IoT Central application. From this device template, an operator can create and connect real fan devices with names such as fan-1 and fan-2. All these fans have measurements, settings, properties, rules, and a dashboard that users of your application can monitor and manage. Only builders and administrators can create, edit, and delete device templates. 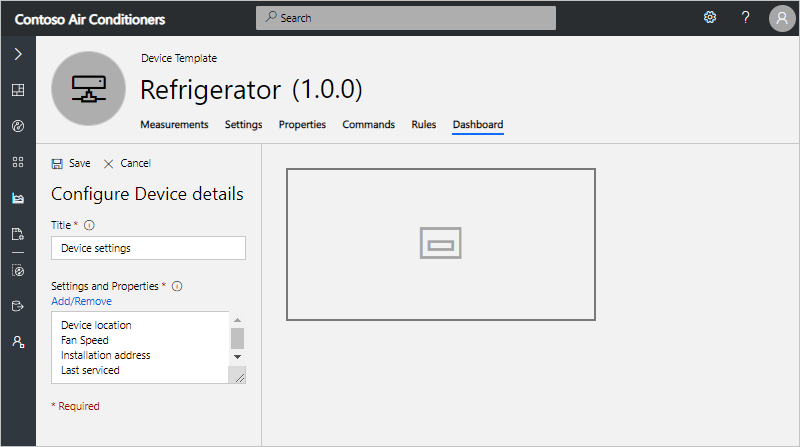 Any user can create devices on the Device Explorer page from existing device templates. Navigate to the Device Templates page. To create a template, start by selecting +New. To get started quickly, choose from the existing pre-built templates. Otherwise, select Custom, enter a name, and click Create to build your own template from scratch. When you create a custom template, you see the Device Details page for your new device template. IoT Central automatically creates a simulated device when you create a device template. A simulated device lets you test the behavior of your application before you connect a real device. The following sections describe each of the tabs on the Device Template page. Measurements are the data that comes from your device. 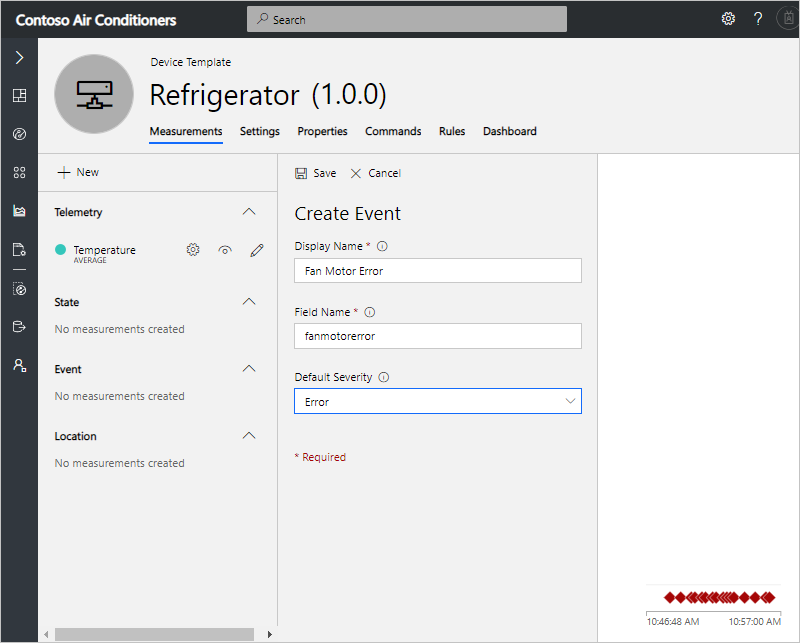 You can add multiple measurements to your device template to match the capabilities of your device. 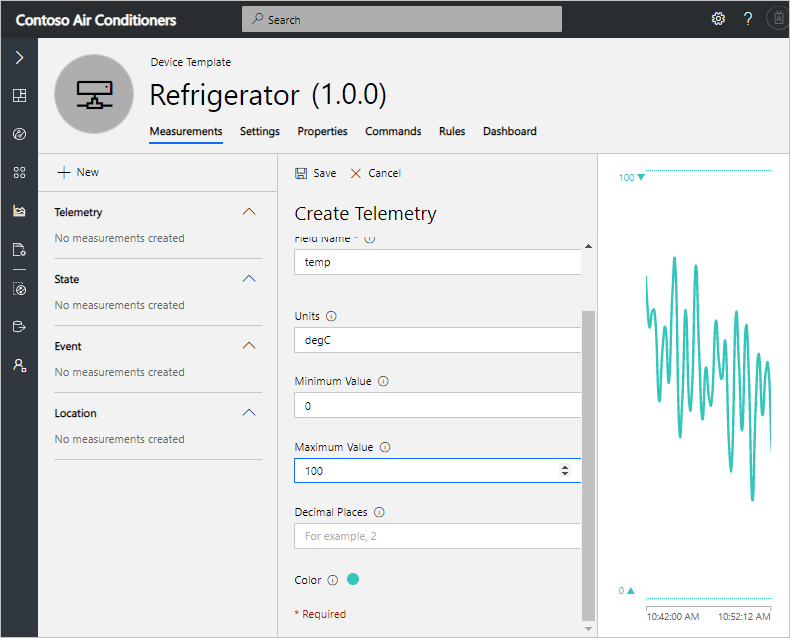 Telemetry measurements are the numerical data points that your device collects over time. They're represented as a continuous stream. An example is temperature. Event measurements are point-in-time data that represents something of significance on the device. A severity level represents the importance of an event. An example is a fan motor error. State measurements represent the state of the device or its components over a period of time. For example, a fan mode can be defined as having Operating and Stopped as the two possible states. To add a new telemetry measurement, select + New Measurement, choose Telemetry as the measurement type, and enter the details on the form. The field names in the device template must match the property names in the corresponding device code in order for the telemetry measurement to be displayed in the application when a real device is connected. 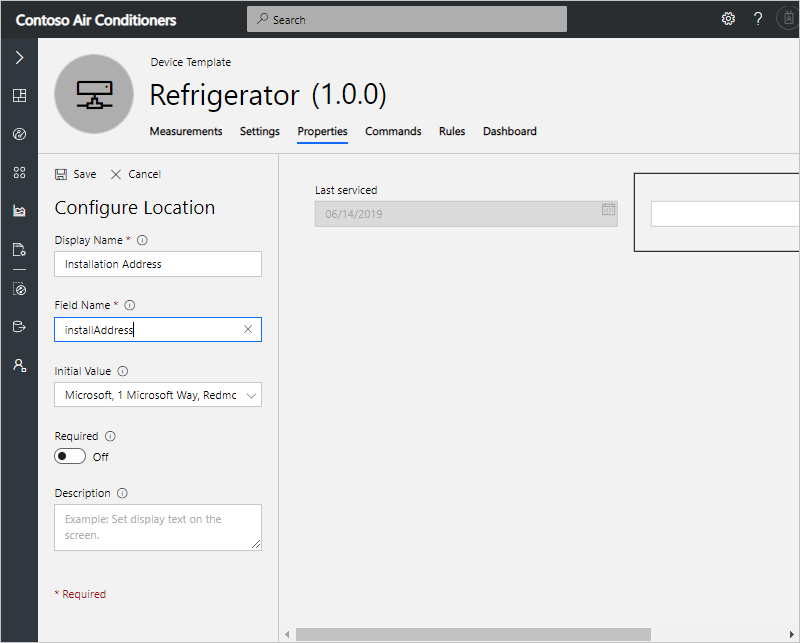 Do the same when you configure settings, device properties, and commands as you continue to define the device template in the following sections. After you select Save, the Temperature measurement appears in the list of measurements. In a short while, you see the visualization of the temperature data from the simulated device. When displaying telemetry, you can choose from the following aggregation options: Average, Minimum, Maximum, Sum, and Count. Average is selected as the default aggregation on the chart. The data type of the telemetry measurement is a floating point number. To add a new event measurement, select + New Measurement and select Event as the measurement type. Enter the details on the Create Event form. Provide the Display Name, Field Name, and Severity details for the event. You can choose from the three available levels of severity: Error, Warning, and Information. For example, you can add a new Fan Motor Error event. After you select Save, the Fan Motor Error measurement appears in the list of measurements. In a short while, you see the visualization of the event data from the simulated device. The data type of the event measurement is string. To add a new state measurement, select the + New Measurement button and select State as the measurement type. Enter the details on the Create State form. Provide the details for Display Name, Field Name, and Values of the state. Each value can also have a display name that will be used when the value appears in charts and tables. For example, you can add a new Fan Mode state that has two possible values that the device can send, Operating and Stopped. After you select Save, the Fan Mode state measurement appears in the list of measurements. In a short while, you see the visualization of the state data from the simulated device. If the device sends too many data points in a small duration, the state measurement appears with a different visual. Select the chart to view all the data points within that time period in chronological order. You can also narrow down the time range to see the measurement plotted on the chart. The data type of the state measurement is string. Settings control a device. They enable operators to provide inputs to the device. You can add multiple settings to your device template that appear as tiles on the Settings tab for operators to use. You can add many types of settings: number, text, date, toggle, pick list, and section label. Settings can be in one of three states. The device reports these states. Synced: The device has changed to reflect the setting value. Pending: The device is currently changing to the setting value. Error: The device has returned an error. After you select Save, the Fan Speed setting appears as a tile. An operator can use the setting on the Device Explorer page to change the fan speed of the device. Properties are metadata that's associated with the device, such as device location and serial number. Add multiple properties to your device template that appear as tiles on the Properties tab. A property can have a type such as number, text, date, toggle, device property, label, or location. An operator can specify the values for properties when they create a device, and they can edit these values at any time. Device properties are read-only and are sent from the device to the application. An operator cannot change device properties. When a real device connects, the device property tile is updates in the application. Device properties that the device reports to the IoT Central application. Device properties are read-only values reported by the device and are updated in the application when a real device is connected. Application properties that are stored in the application and can be edited by the operator. The device doesn't recognize application properties. After you select Save, the last serviced date for the device appears as a tile. After you create the tile, you can change the application property value in the Device Explorer. 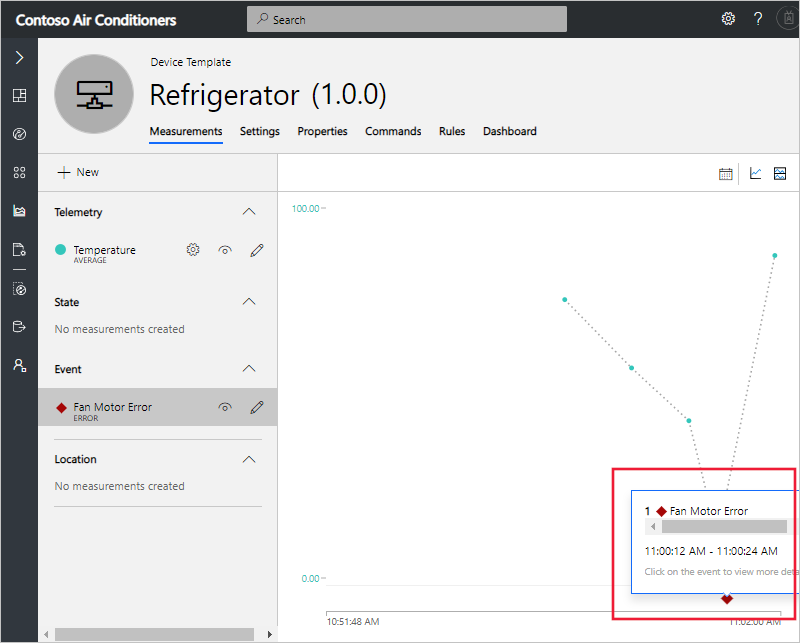 You can give geographic context to your location data in Azure IoT Central and map any latitude and longitude coordinates of a street address. Or you can map latitude and longitude coordinates. Azure Maps enables this capability in IoT Central. Location as an application property, which is stored in the application. The device doesn't recognize application properties. Location as a device property, which the device reports to the application. Navigate to the Properties tab. In the library, select Location. Configure Display Name, Field Name, and (optionally) Initial Value for the location. Select Save. An operator can update the location value in the Device Explorer. Select Device Property from the library. Once the real device is connected, the location that you added as a device property is updated with the value sent by the device. 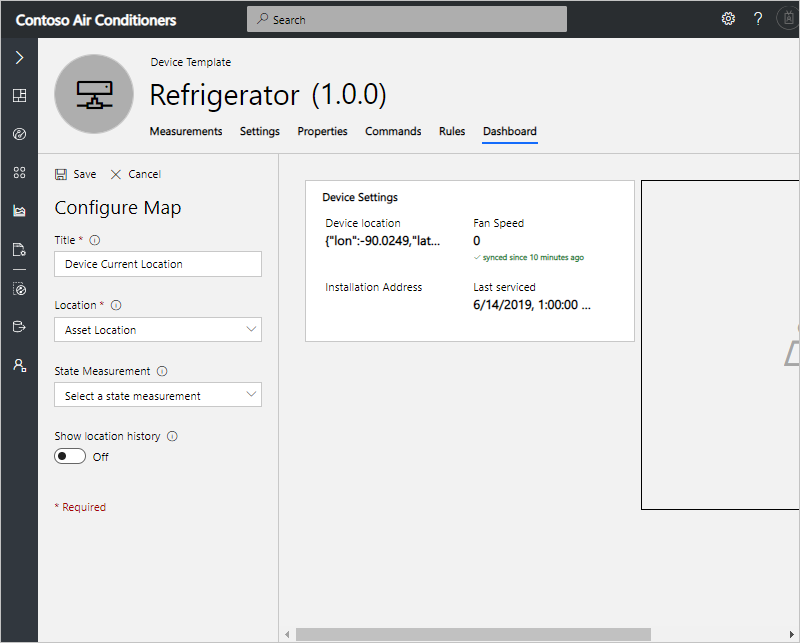 Now that you've configured your location property, you can add a map to visualize the location in the device dashboard. Commands are used to remotely manage a device. They enable operators to run commands on the device. You can add multiple commands to your device template that appear as tiles on the Commands tab for operators to use. As the builder of the device, you have the flexibility to define commands according to your requirements. How is a command different from a setting? Setting: A setting is a configuration that you want to apply to a device. You want the device to persist that configuration until you change it. 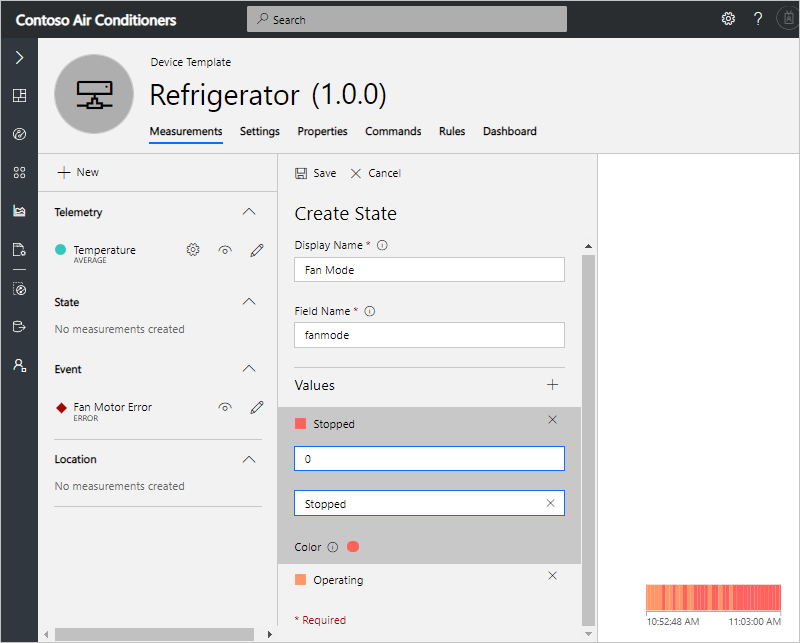 For example, you want to set the temperature of your freezer, and you want that setting even when the freezer restarts. 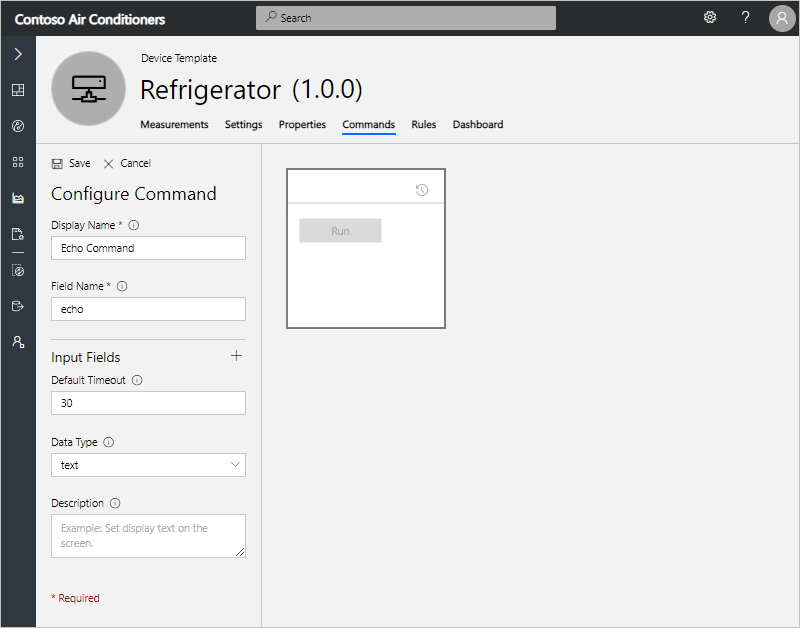 Command: You use commands to instantly run a command on the device remotely from IoT Central. If a device isn't connected, the command times out and fails. For example, you want to restart a device. After you select Save, the Echo command appears as a tile and is ready to be used from the Device Explorer when your real device connects. The field names of your command must match the property names in the corresponding device code in order for commands to be run successfully. Telemetry rule, which is triggered when the selected device telemetry crosses a specified threshold. Learn more about telemetry rules. The dashboard is where an operator can go to see information about a device. As a builder, you can add tiles on this page to help operators understand how the device is behaving. You can add multiple dashboard tiles to your device template. You can add many types of dashboard tiles such as image, line chart, bar chart, key performance indicator (KPI), settings and properties, and label. Now when an operator views the dashboard in the Device Explorer, they can see the tile. If you configured a location property, you can visualize the location by using a map in your device dashboard. Navigate to the Dashboard tab. On the device dashboard, select Map from the library. Give the map a title. The following example has the title Installation Location. Then choose the location property that you previously configured on the Properties tab. In the following example, Installation address is selected. Select Save. The map tile now displays the location that you selected. You can resize the map to your desired size. Now when an operator views the dashboard in the Device Explorer, all the dashboard tiles that you've configured, including a location map are visible.